Brookdale Senior Living® communities have served seniors and their families since 1978. Brookdale is the nation's largest owner and operator of senior living communities throughout the United States and a national provider of senior-related services. 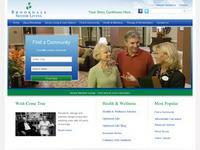 Provides assisted living, independent living, Alzheimer's and dementia care communities. SeniorPeopleMeet.com is the number one Dating Community for Seniors. Senior Singles know SeniorPeopleMeet.com is the premier online dating destination for senior dating. Browse mature and single senior women and senior men for free, and find your soul mate today.